Were you looking for California Estate Planners lawsuits? Financial elder abuse occurs when people cheat elderly people out of their money or their property. California law defines elderly people as those who are aged 65 or older. Because the elderly are uniquely susceptible to being cheated as they grow older, California's legislature passed the Elder Abuse Act to provide a remedy and financial elder abuse lawsuits for elderly people who have been cheated. Send your Financial Elder Abuse claim to a lawyer who will review your claim at NO COST or obligation. Unfortunately, elderly people are often particularly dependent on other people for their care, which puts them in a vulnerable position. They can be taken advantage of by people they trust, such as family members, by other caregivers, or by staff at nursing homes. 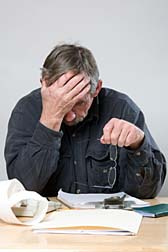 There are a variety of forms of financial elder abuse. Some are perpetrated by people who do not know the victim, such as telemarketing fraud or identity theft. However, some forms of abuse are carried out by family members or caregivers. In some cases, the abuse is as complex as a child convincing a parent to put property in his or her name so that, when the parent dies, the child owns the property outright (to the detriment of other siblings), or convincing an elderly person to buy something they cannot use, such as convincing an elderly person to buy a lifetime membership in a gym. In other cases, it is as simple as stealing money from the senior's wallet when he or she is not looking. For elderly people who have fallen victim to financial elder abuse, a lawsuit can provide a variety of remedies. First, the victim can recover money the taken or can recover property itself, such as when a valuable item is taken. Second, victims can recover attorney's fees because the statute protecting elderly citizens provides for attorney's fees in a lawsuit. Third, although rare, victims may be able to recover punitive damages. It is uncommon for an elderly victim to expose the abuse or approach a lawyer for help. Usually, that falls to family members who become suspicious that their loved one has been cheated or a friend who notices unusual behavior. Telephone/email scams: the senior is contacted by someone requesting money in the form of deposit or upfront tax payment on money to be given to the senior later. The senior pays the deposit but never receives the money. These scams are sometimes referred to as lottery scams. Pigeon drop: the senior is approached by someone claiming to have a lot of money but unsure of what to do with it. The scammer agrees to leave the money with the senior in exchange for a "good faith" deposit of money. The scammer leaves with the money and the senior is left with fake money. Investment scams: the senior is convinced to invest his or her money in a variety of scams and schemes including a Ponzi scheme, pyramid scheme or fake real estate investment. Sweetheart swindle: the senior is befriended by a perpetrator who agrees to either marry or take care of the senior. The perpetrator, who says he or she will be receiving a large amount of money soon, then claims to require money for a family emergency and asks for a loan from the senior to be paid back once the scammer's own money comes through. Imposters: the senior is approached by people who appear to be employees of a utility company and who say they need access to the home. Once they obtain access, the perpetrators steal the senior's property. Other scams targeting seniors include funeral and cemetery fraud, in which funeral homes add unnecessary charges and fees to a funeral; fraudulent anti-aging products, seniors are sold fake anti-aging products and reverse mortgage scams, in which scammers steal equity from a senior or use the senior to steal equity from another property. Every state has at least one toll-free number—either an elder abuse hotline or helpline—that people can call to report elder abuse. California has Civil and Civil - Private laws developed from the Elder Abuse Act, which provides remedies for elders who have been financially abused. If you live in California and you believe you or a loved one has been a victim of financial elder abuse, please click the link below to send your complaint to a Financial Elder Abuse lawyer to evaluate your claim at no cost or obligation. Elder Financial Abuse: Whom Do You Trust? Financial Elder Abuse: “We’re Targets,” Says ..
California to Take a Tougher Stance on Financ..
Swindled Seniors: Former California Judge to ..
California Bill Makes It Easier to File a Fin..
. There is Statute 21380D (I think) to protect elder's trusts. If anyone OTHER THAN a BLOOD RELATIVE influences or implements changes to an elder's trust to benefit them or their people, it is illegal. IT'S FRAUD! Not even a wife of 40 years can aid their elder husband to change his trust to benefit herself and/or her people. NO WAY. Alert your attorney to this little known statute! 21380. (a) A provision of an instrument making a donative transfer to any of the following persons is presumed to be the product of fraud or undue influence: GO TO CA Codes 21380 and get the power of the law on your side. There is nothing worse then finding out your own brother and his mistress, at the time, have stolen not only $500,000.00+ a lot more. But managed to get my 89 yr. old father to remove me and the grandchildren from the Trust, and add my brother's mistress (now his wife)as a replacement. All this done while not allowing me to see my dad for 8yrs. There needs to be more regulations. I would really like to know why no one was notified when all this money going out of the estate to the same $30,000.00 here $50,000.00 there, $307,000.00, here's an man in his late 80's, I'm keep from seeing him, and the Trust is not noticing large sums of money going to the same person with in a years time? Victims should know that even if they get a major victory in court, it is likely the defendant will just declare bankruptcy and walk away. Look at Dan Harkey of Point Center Financial who was found guilty of Elder Financial Abuse and started another real estate company, refusing to pay the $13M award. The courts and laws were designed to help the rich and influential. Period. I have two tenants in a single family home in San Francisco. They are trying to force me to sell to them, and I don't want to. They decided not to pay the rent and claimed that the property was under rent control. The rent board found in my favor, but they are appealing it, and it will take another year. In the meantime, I can't evict because of their rent control claim. They are more than $70,000 behind in rent and I can't do anything. This is a financial scam to force me to sell. Is there anything I can do? My mother is being financially abused by her ex-husband. He married her to stay in the country. Then during their time together, he removed $600k from her stock accounts with her permission. She thought they were investing together. He has divorced her, and her Alzheimer’s has progressed. She still believes he will take care of her. He tells her that now he has removed two rental properties from her and has his name on her trust, and removed all her kids from it. I had a young couple that had been friends for a few years. They wanted to buy a house in another city even tho they had a house in the same city I lived in. Besides the money they put down on the new house they needed an additional $63,000.00. My house was free and clear so I borrowed the money on my house to help with the down on there new house. I drew up a promissory note and a deed of trust which covered both their new house and the one they were moving from. They were delighted and assured me they had the old house rented which they did and that they would put it on the market for sale. They paid on time for 5 years interest only. They said they never got a good contract on the old house so it never sold. Now the $63,000.00 was due and I was told they could not afford the new house anymore so they said they would try to do a short sale to pay me off. They continued to rent out the old house, lost the new house in foreclosure and went Chapter 13 in Bankruptcy. I contacted an attorney and was told to bad I loose and the trustee said there was not enough value in the rental to cover only the 1st loan and not my second loan. Lost again. I was collecting monthly from the borrower but I also made payment on my house where I borrowed the money to loan out. Guess the laws for seniors are not so tough. 2 siblings took elderly father to new lawyer who changed POA from original documents naming other sibling as POA. All funds including deceased mother's trust now moved out of state to Wisconsin.